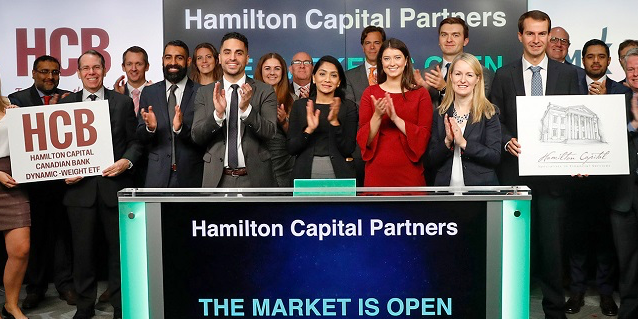 On October 2, 2018, Hamilton Capital and its partners joined the TMX Group to open the market to launch Hamilton Capital Canadian Bank Variable-Weight ETF (HCB;TSX). HCB commenced trading on the Toronto Stock Exchange on October 1, 2018. Hamilton Capital is dedicated to helping Canadians investors get more out of the financial services sector. We share our research and insights on the Canadian and global financial services sector. You can unsubscribe at any time. We are Canada's leading specialists in the financials sector. Subscribe to get notified of our latest insights, updates and upcoming events. Our Insights commentary is one of the best sources for deep and timely analysis of the Canadian and global financial sectors. We rarely send notifications more than a couple of times a month.